This past weekend, my husband, youngest daughter, and I attended the Country Living Fair in Atlanta. It was held at Stone Mountain Park which is just amazing to see. Hometalk, where I post (and find great posts! 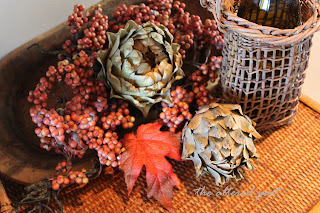 ), hosted a blogger meet and greet along with the Country Living Editors. It was great getting to meet face-to-face with some of the bloggers I follow...Kathy of A Delightsome Life (a fellow homeschooling mom! ), Kim of Savvy Southern Style (love her sitting room with the dogs and hunting decor! ), Rhoda of Southern Hospitality (who's provided me with a lot of inspiration over the past couple of years!) 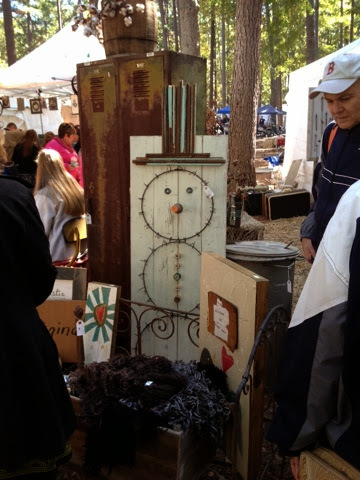 and Linda of Coastal Charm, and others that I met for the first time at the fair. Super sweet and really helpful at answering questions for an amateur like me. 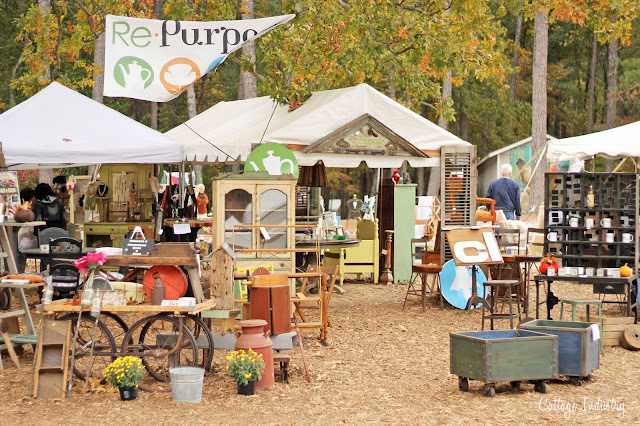 Cari Cucksey, of HGTV's Cash and Cari, had a booth at the Fair and took a minute to speak with us about her business of repurposing furniture and other items to resell. Isn't she cute?! Love the vintage boots. 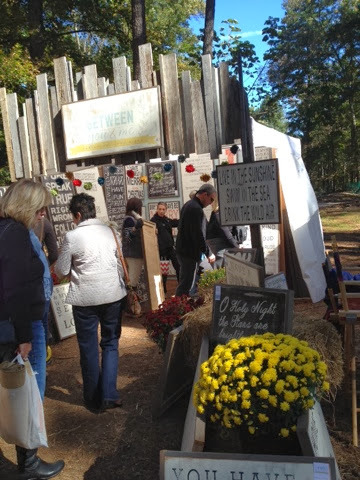 Stone Mountain on its own is a great place to visit but throw in the Country Living Fair with loads of great vintage, antique, and handmade items PLUS an amazing fall day...that's just icing on the cake! 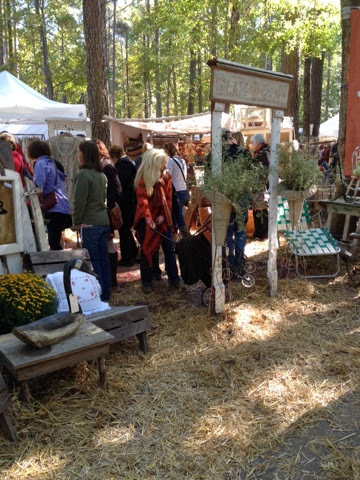 Here's a look at just a few of the booths this year. I'm sorry I didn't get more. I was like a kid in a candy shop with all the goodies and I kept forgetting to take pictures! 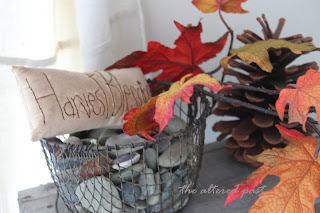 These amazing signs are handmade by Tara of Between You and Me. I follow her blog but didn't get a chance to speak to her. Her booth was super busy! One of the adorable campers from Sisters on the Fly. It's on my bucket list to join them one day! So, what did I come home with?? Don't laugh. It's not a lot but it's really cute! 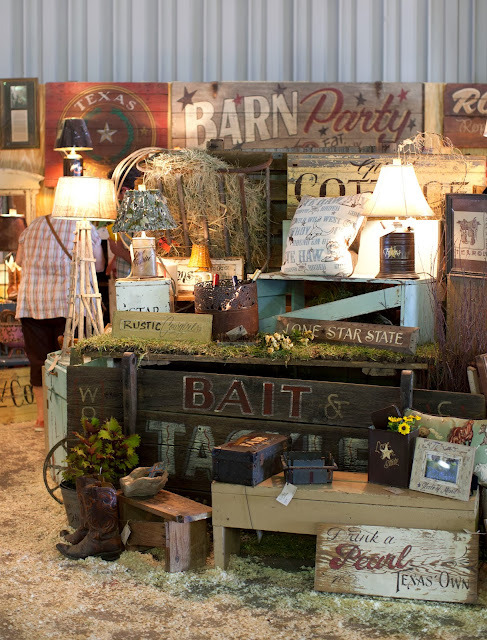 I hope you enjoyed visiting the Country Living Fair with me. As always, I appreciate your stopping by and God bless!! 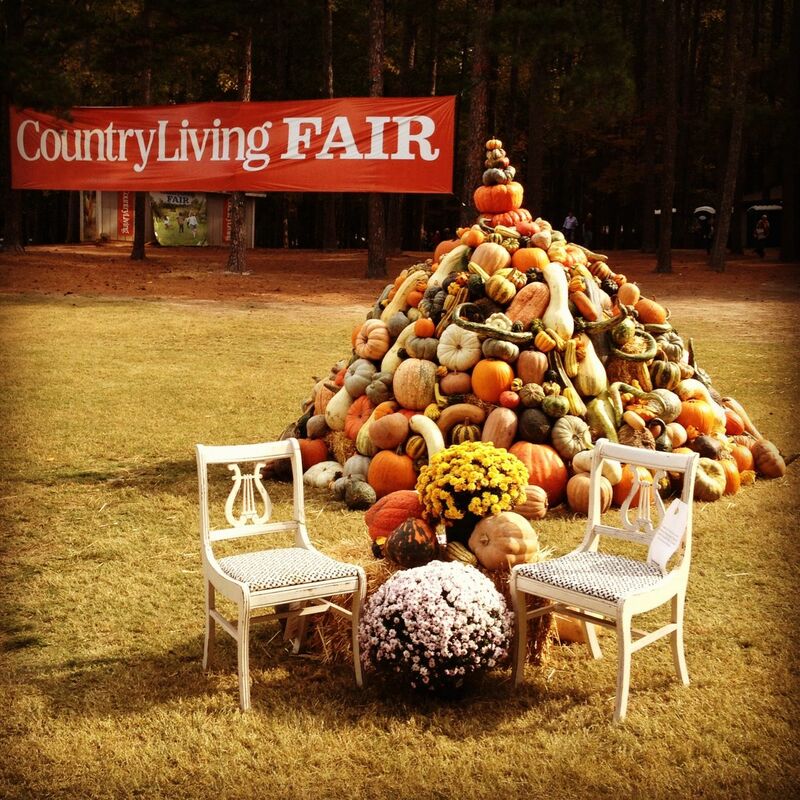 Are you going to the Country Living Fair in Atlanta this weekend!? I am! I haven't been so this will be my first. From the photos of prior years, I'm expecting great things. On Saturday, I'll also be attending a Blogger Meet and Greet with the Country Living Editors and the great folks from Hometalk. I'm not sure if I'm more excited about the things I'll find at the Fair or more nervous about attending an official blogger event. I feel like such a small fry in the blogger world. This will be a big step toward what I hope to do in the coming years. We'll see! 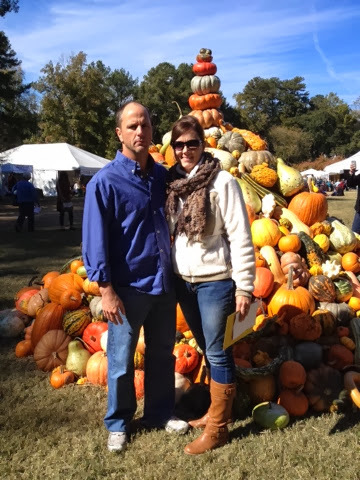 The Fair is being held at Stone Mountain Park which is beautiful. 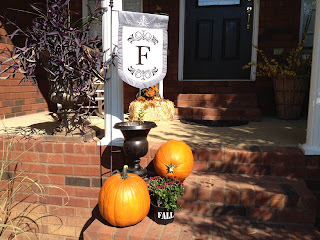 If the weather goes as predicted, it should be a perfect Fall day to be outside shopping for goodies, meeting other bloggers, and spending time with my sweetie (the hubby) who's offered to go with me. I'm attaching a sleeve with my blog information to an old recipe card. I love the old handwritten recipes. I don't always agree that technology is best. There's a charm to the old recipes written by a homemaker, mom, wife, new bride, grandmother. I've had both my mother and my mother-in-law write their favorite recipes on cards so that my daughters could have them when they are grown. I think it will be something they treasure. Well, I'm off to make more business cards. 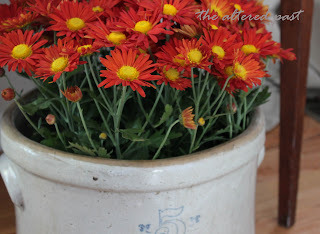 Pull out my old shopping cart and get ready to bring home some great finds. Hope to see you there! 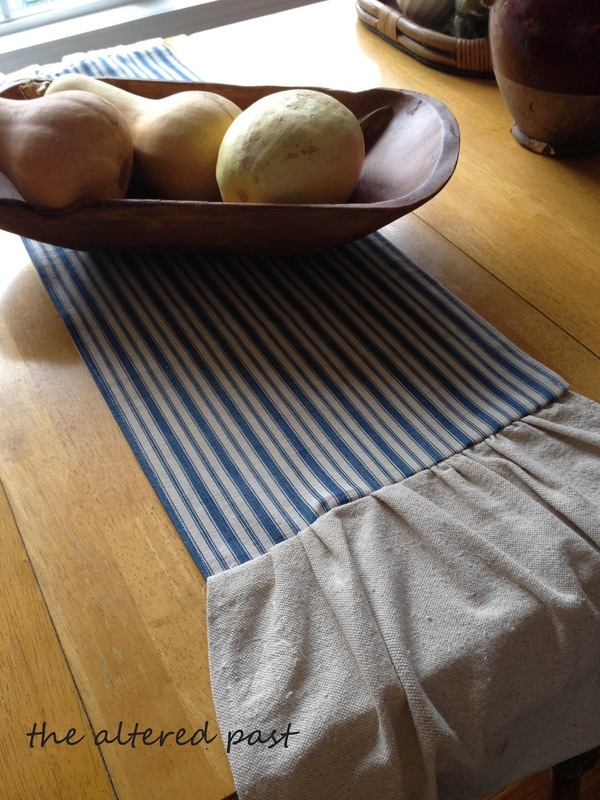 A simple table runner that works perfect for Fall or really everyday...vintage blue striped ticking and a dropcloth ruffle. 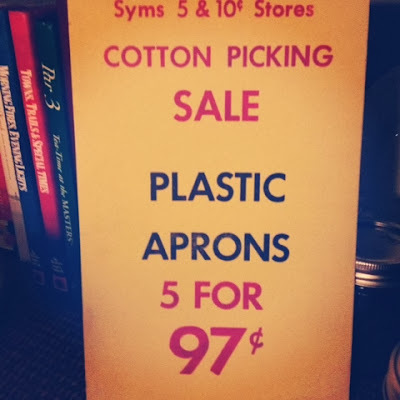 Months ago I came across some fabric remnants at the thrift store. Included in the bundle were 3 different ticking pieces. 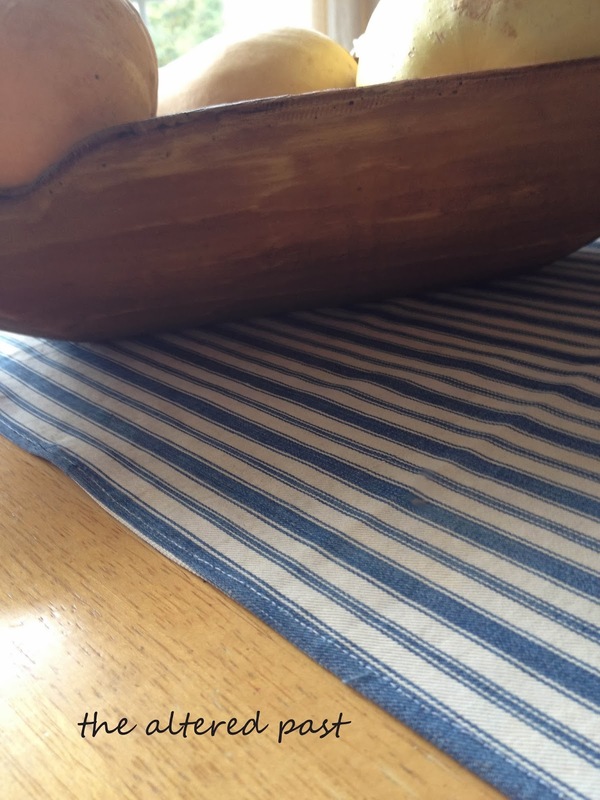 This blue striped ticking was the perfect width for a table runner but I needed to add some length for it to drape over the edges of the table. Scrounging through my stash of fabric, I came across some extra pieces of a drop cloth. They were leftover from my attempt to make slipcovers for our chairs in the kitchen. NOTE: There will not be a post on the slipcovers later. Nor photos. It's just too soon to talk about. Back to the runner...I'm really not a seamstress. I do own a sewing machine only because there is no driver's test to take before purchasing one. However, no one was harmed and this project was pretty easy. I made a simple hem stitch to the sides of the ticking for a finished look. I do like raw edges in decorating but the raw edge on this old fabric was not attractive in any form. You will need two pieces of the dropcloth, one for each end. 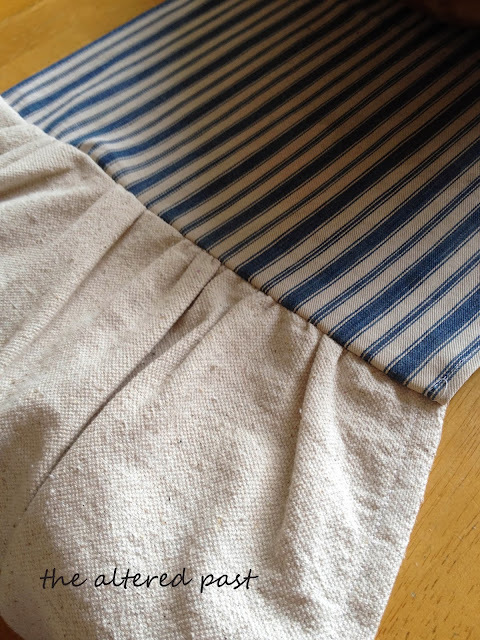 In figuring the width measurement of dropcloth to create the ruffle, I doubled the width of the ticking. This will make a nice soft ruffle. The greater the ratio of runner to ruffle, the fuller your ruffle will be. I'm sure there is an official way to create a ruffle with the sewing machine but most of my projects follow anything but official methods. My right brain doesn't always "play well with others" when it comes to listening to the left brain give instructions. So, right brain comes up with its own version. It's how we roll. Creating the ruffle for right brainers - set your sewing machine stitch length to the longest setting. Sew a straight stitch from one end to the other of the fabric. This is done before attaching the ruffle to the ticking. You are sewing a straight line just on the end of the dropcloth. Do not double back over your stitches. Also, allow extra thread before starting and after finishing the stitching. Once you clip the threads and remove from the sewing machine, simply hold one end of the threads and gently pull, working the fabric back toward the other end. You can get the ruffles as tight or as loose as you choose. Just be careful not to pull too hard and break your stitching. Clear a mud? I hope not. Most of you probably know more about making ruffles than I do :) The best part is if you don't get it right the first time, the stitches pull out easily and you just try again. Repeat the ruffle stitching for the other piece. Once you have both ruffles made, place one at each end of the runner, right side to right side. Align the edge of the runner to the ruffle (and it will be kind of bunchy because of the ruffle stitching), then run a straight stitch from end to end. You will want to double back on your stitches when you begin sewing and when you get to the end. This will lock the stitches so that they don't come apart. Now, once each end has been attached, give your runner a simple press over the seams with an iron. 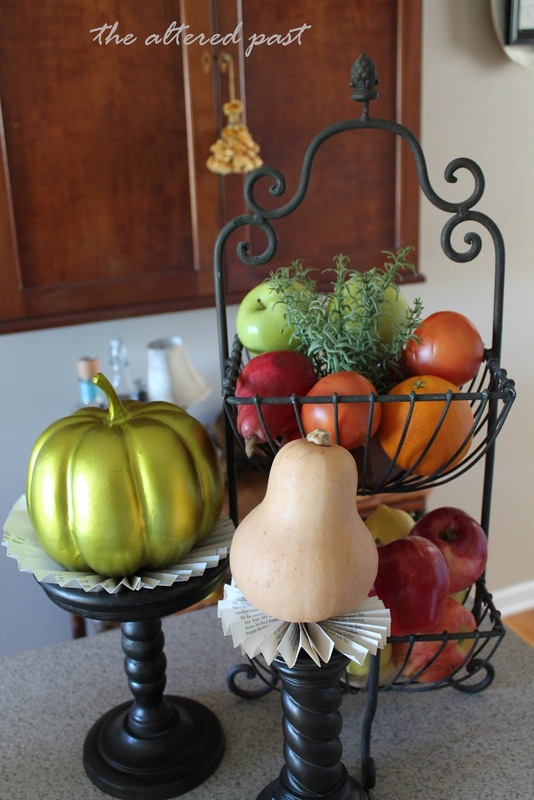 Place on your table and admire your accomplishment! Red ticking with dropcloth would be great for Christmas, Valentine's Day, Fourth of July, practically all holiday occasions. I've had this one on my kitchen table for about a month. It's our everyday table, where we eat all of our meals. I like decorating the table we use because we actually get to enjoy it. How do you decorate your everyday table? 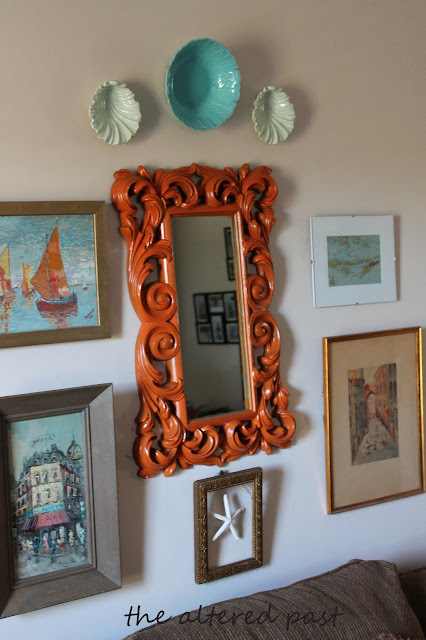 As school was nearing the end this past Spring, I had great plans for repainting many rooms in our home during the summer break. Most of the rooms had not been repainted since our house was built in 2003. I was so excited. I poured over color samples. Pinned lots of great looking rooms for inspiration. Well, as the old saying goes, "the best laid plans of mice and men (and decorators!) often go awry." The last week of school, our friend, who is also a real estate agent, contacted us with an offer. Wait, what?? Our house isn't even on the market! That's right. His office was working with a couple that had been looking for a place with acreage, storage, outbuilding, pond...our place. They had been unsuccessful in finding exactly what they were looking for but our friend thought our place fit the bill. He also knows that we had talked more than once of selling our place and moving back into town for the convenience of being closer to our kids' many activities. So, we took the offer with a contingency of the buyer's home selling. And we waited and waited and waited. All summer we waited until our contract ended in mid August with no sale. Yeah, mid August, when school begins and hectic schedules and busyness. And my great plans were pushed aside. I took the Labor Day break to at least get our living room/breakfast area painted. 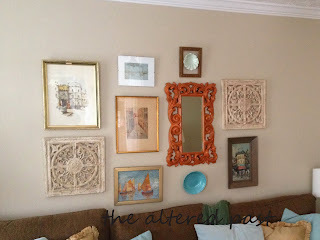 I used Valspar's Colonial Beige and had it color matched with Behr paint. 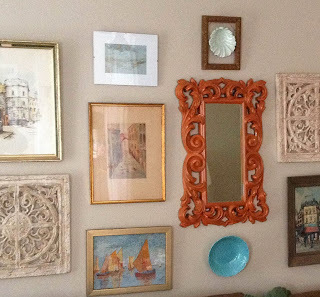 It is called a beige but it really is a great neutral between beige and grey. This room gets a lot of light in the morning and changes during the day as the sun moves to the front of our house. It worked as the perfect greige for my house. From the photo, it doesn't look that much different than the original paint but it is. For one thing, the new paint is a grey/beige and in an eggshell finish. The original paint (contractor grade I'm sure) had a pink fleshy color and was a flat finish. Actually, the builder used flat finish EVERYWHERE in the house, including the bathrooms. Who does that? The master bedroom and bath are next on my list. Do you know what steamy showers do to flat paint?? It isn't pretty. I'll try to post pictures of that when I redo the master bathroom. After painting the living room, I had the chance to rework my gallery wall behind the sofa. It was by accident that I moved some of the pieces. I thought I could remember where everything was before painting. Thankfully, I couldn't remember and the result is even better than it was before. 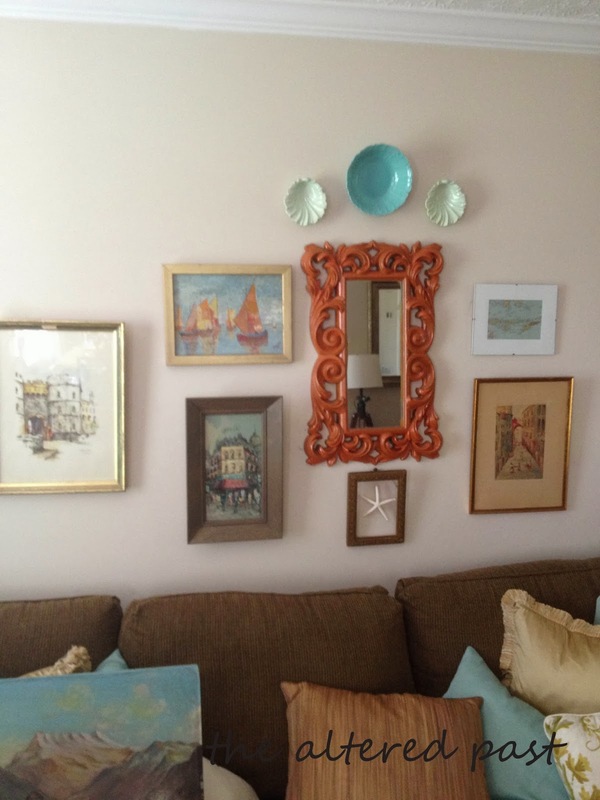 I use a lot of orange and aqua in our main living areas and I love the combination. It works perfect with Fall decor too! As always, thanks for stopping by and God bless! I have to beg your forgiveness for being gone soooo long. Life, ya know! In the real world, I homeschool our youngest two daughters. They are in 9th and 12th grade this year. 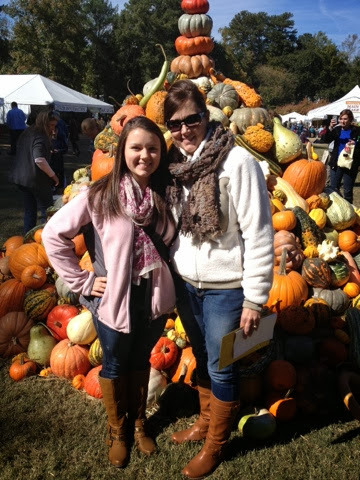 I'll soon be coming to the end of our homeschooling journey that began 17 years ago with our oldest. As each of my daughters approached their high school years, I enrolled them in a once a week tutorial for those tough subjects like chemistry, calculus, foreign languages, etc. The students meet once a week with a tutor and receive instruction on the subject then they go home and complete assignments the other four days of the week. It's a college prep tutorial and it's been exactly what I needed for my girls to be prepared to go from working on my deadlines to working by someone else's. The tutorial has been in existence for the past 15 years and has helped hundreds of homeschool students in the upper level subjects. The founders had a great idea and the tutorial's ongoing success proves it. Four years ago, the original founders completed their homeschooling and needed to move on to the next chapter in their lives. So, since I still needed the services of the tutorial, I was asked to take over as director. I've always said I'm not a leader, I'm a worker bee. Tell me what to do and I'll do it but my right-brain thinking mind is at a total loss when it comes to organizing and leading. But, takeover I did. It's been one of the hardest things I've done but God has been so faithful to guide me through the tough times and has grown me in areas I really needed. Running the tutorial with an enrollment of 100+ as well as homeschooling our two daughters has commanded most of my time and energy this past year. I apologize for being AWOL for so long. I feel God moving me to begin my blog and Etsy store once again. It's my passion and it allows me to use the gifts He blessed me with. 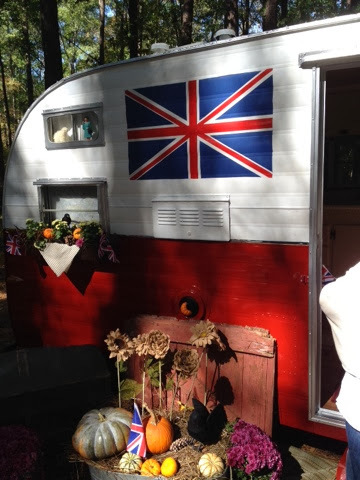 One exciting development recently was an invitation from Country Living to attend a blogger meet and greet before their antiques show in Atlanta at the end of October. I know I'll have plenty to share after that. Again, thank you for being patient and for allowing me to step back in to your lives. I am blessed to have this opportunity and can't wait to share, chat, and grow with you all in the coming months!